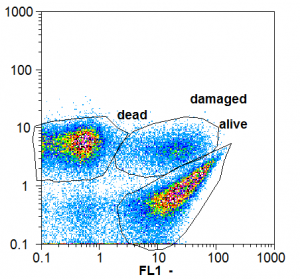 Bacteria physiological state assessment based on flow cytometry. In Montreal, Canada, the research laboratory located within the National Research Council focuses on the genomic and proteomic of microorganisms. It is dedicated to the genetic identification and characterization of microbial strains and microbial safety assessment. In Toulouse, France, at the bacteria research laboratory our goal is to achieve optimal fermentation conditions and preservation while researching the best technological performance of strains. In La Ferté sous Jouarre, France, at the dairy and meat applications laboratory, our goal is to adapt existing or assess new solutions to meet customers’ needs.